You can serve this Gingerbread Chia Pudding for breakfast, or it’s the perfect vegan and paleo meal or snack with its balance of fat, protein, and carbs. The holidays are upon us and I wanted to share an easy snack recipe for this busy week. The next two weeks are actually going to be fairly quiet for me, but I have so many projects and recipes currently in development. So, in that sense, life is staying busy. Oh yeah, and Alan and I just booked a trip to Hawaii for the 2nd week in January. We were both feeling blue when our beloved kitty died unexpectedly two weeks ago, so we did some retail therapy in the form of purchasing this vacation package. The trip will get us away from home for a week and who can be sad in Hawaii? Back to my Gingerbread Chia Pudding. When I was developing this recipe, I was kind of confused how gingerbread differs from pumpkin pie spice. Turns out, it’s all about the ginger (ummmm, duh). I’m not super motivated to make or buy more specialty spice blends, so I just used my leftover pumpkin pie spice from the Thanksgiving holiday and just added an extra pinch of ginger. By the way, this recipe was inspired by the Overnight Pumpkin Chia Pudding recipe I saw in the latest Paleo Magazine issue. Do you subscribe to this magazine? It’s soooooo amazing for recipe inspiration; you can subscribe here (affiliate link)! Combine coconut milk, water, puree, and maple syrup or molasses in a medium size bowl. Use a whisk to stir together. Add the pumpkin pie spice, ground ginger and chia seeds to the bowl and whisk until thoroughly combined. Set aside and whisk again in 5 minutes, making sure that the chia seeds don’t clump together. Refrigerate for at least 30 minutes before serving. Serve with a dollop of your favorite dairy-free yogurt, if desired. Let’s stay connected by e-mail! Sign up here to receive my weekly newsletter with all the latest news and insider info. Oh this is super fun! My girls would love this! I love that the squash is in there too! This would make a great breakfast or snack for my toddler! Ohhhh, thanks Renee!!! I love sneaking in veggies whenever I can, mostly because I have the tastebuds of a toddler! 🙂 Happy holidays. XOXO. This recipe is a winner, I’m sure. I’ll be making it very soon. Hi Judy, thank you for the note and condolences. It’s been a rough two weeks. The grief comes and goes. I’m doing a lot of work to make sure the sadness doesn’t turn to depression, but I don’t think that is happening. I do miss my little Xena terribly. It’s so hard to go through the day without her watching my every move and seeing all the cute, funny stuff she did. Oh my goodness, -12 degrees sounds like cold beyond my comprehension. I feel like such a wimp living in California where I won’t even go outside when it’s below 50. Happy holidays, Judy. XOXOXOXO. Wow, this looks delicious!!! I am off to the kitchen now to whip up a batch! So sorry to hear about your kitty passing. They are part of the family and I am sure your cat will be missed. I am glad you are getting away to refresh in January! Thank you for such a sweet note, Halle. LMK how you like the chia pudding. Happy holidays to you. XOXO. 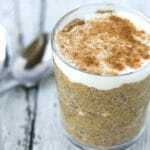 Love love chia pudding and this gingerbread chia adds another refreshing flavor to this everyday everything breakfast and snacks ! Thanks so much for the note!! XOXO. I love chia pudding! And this recipe is perfect for winter! Thanks for sharing! This is brilliant!!! 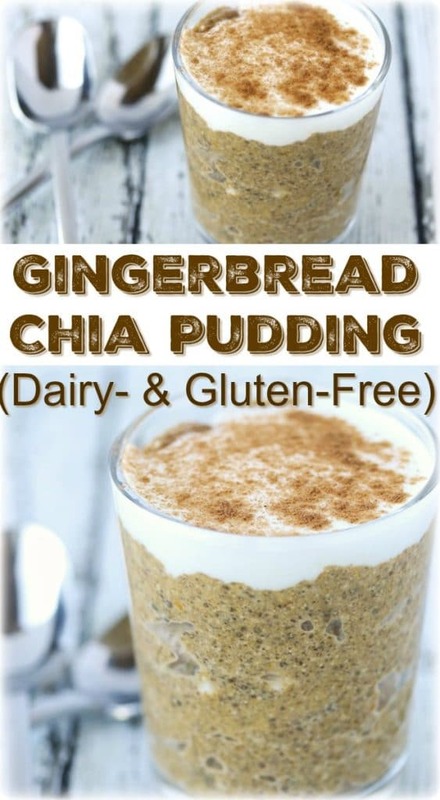 I LOVE gingerbread and chia pudding is so much fun and so easy to make. Anything gingerbread and I’m there! Must be my reddish hair, ha! Love your idea of just adding ginger to your pumpkin pie spice – I’m not usually one for buying specialty spice blends either, unless they’re on sale! Awww, thanks Dana! 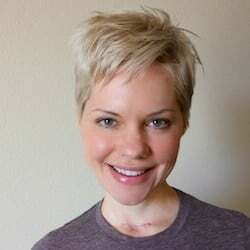 I’m super excited to find you and your blog. Just subscribed to your new posts in my reader. Happy holidays! P.S. Your hair is sooooooo pretty. XOXO. Chia puddings are the best for on the go breakfasts, and I love this festive gingerbread version! I hope you enjoy your time in Hawaii, sunshine and sand sounds pretty good right now! Thanks, Kari!!! I hope it won’t seem too mean if I share pictures of Hawaii when I’m there. I’m already dreaming of palm trees and warm weather. It’s even cold in California right now. Happy holidays! Hey Carrie – I’m SO sorry about your beloved kitty. I know how deeply it impacts an entire family when a family pet passes on. For these kinds of sad days, sweets are perfect and this pudding looks absolutely incredible. I hope you enjoy Hawaii! Ohhhhh, thank you Kelly. I so appreciate the condolences and sweet words of support. You are so amazing, sending you lots of love and joy for the holidays and 2017. XOXO. I’m so sad to hear about your kitty! Animals are definitely family members in my opinion, and it’s always hard to hear of one passing. But I’m sure she would want you to be happy, and Hawaii sounds like a perfect place to be happy! This chia pudding makes ME happy 🙂 I want some right now! Thank you, Michele, I appreciate such kind words and compassion. My previous kitty lived to be 18, so we had a much longer time to say good-bye as she got older. I so miss my little Xena who was only 12 when she passed, but notes like yours have helped me so much through the grief. Happy holidays! XOXO. 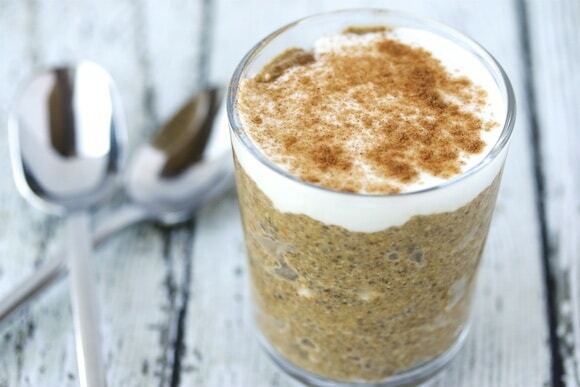 I love the many forms and flavors chia pudding can take on! I love this fun and festive twist for the holidays! I’m newly obsessed with chia pudding, this recipe is perfect. Love all the delicious, seasonal flavors here! Sounds so comforting. I love all your pudding recipes! I’m glad you shared another exciting one.